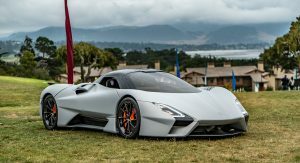 SSC North America has used the Pebble Beach Concours d’Elegance to unveil the 2019 Tuatara. 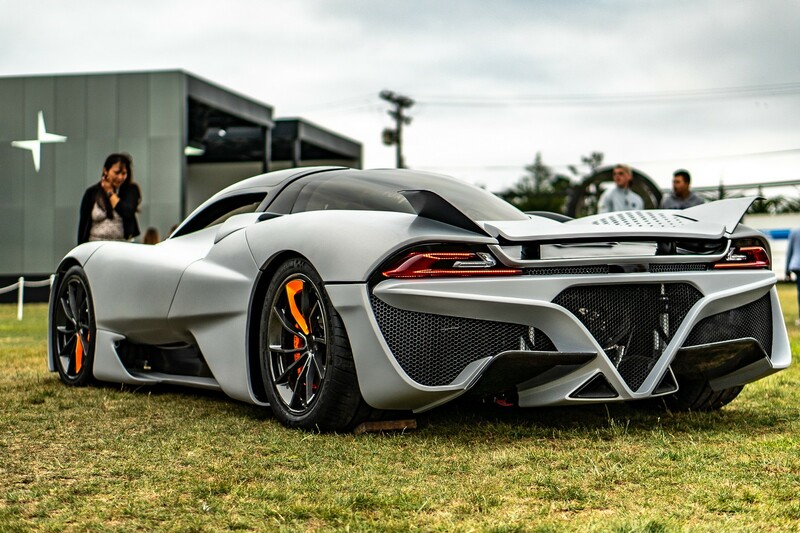 Looking virtually identical to the concept that was unveiled over seven years ago, the production Tuatara has a sleek carbon fiber body that allows the model to have a drag coefficient of 0.279. 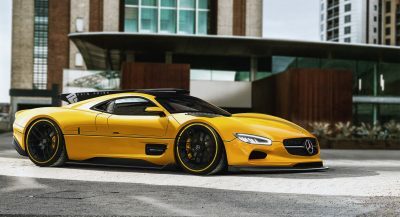 The company says this is significantly lower than competitors such as the Bugatti Chiron (0.36), Koenigsegg Agera (0.33) and Hennessey Venom F5 (0.33). Overall, the car measures 174.4 inches (4429 mm) long, 78.4 inches (1991 mm) wide and 43 inches (1092 mm) tall with a wheelbase that spans 105.2 inches (2672 mm). The extensive use of carbon fiber also allows the model to have dry weight of 2750 lbs (1247 kg). 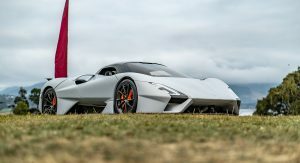 SSC North America hasn’t released detailed specifications, but the company confirmed the Tuatara will be powered by a twin-turbo 5.9-liter V8 engine which features an 8800 rpm redline and an 8.8:1 compression ratio. 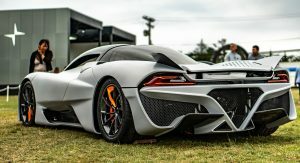 The company went on to say the engine will produce 1350 hp (1006 kW / 1368 PS) when running on 91 octane fuel. 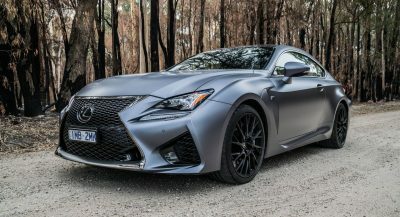 The engine can also run on E85 and this will allow the mid-mounted behemoth to produce an astounding 1750 hp (1305 kW / 1774 PS). 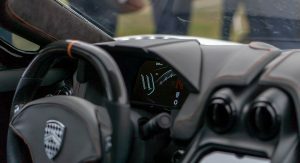 The engine will be connected to a seven-speed “computerized” manual transmission which features a “robotic shift system.” The company declined to elaborate, but has previously said the engine and transmission will allow the Tuatara to have a “top speed that is projected to easily surpass the current world record.” SSC is presumably talking about the Koenigsegg Agera RS which topped out at 284.55 mph (457.94 km/h) and averaged a two-way top speed of record of 277.87 mph (447.19 km/h). 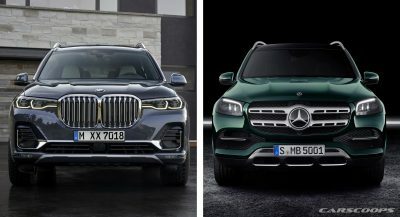 There’s no word on production numbers or pricing, but additional information will likely be announced closer to the car’s launch. Finally. I know it’s been awhile but I’m just glad to see it. And I can see some of the interior too which is nice. I do hope to see more. First Hennessey, now this, keep it up Murica. Interesting, but I wonder how this and the Venom F5 will behave on the road. Will these be a match for the very best (Porsche, Ferrari, McLaren) or are they just about speed records? I’m not sure about the F5 as Hennessey had only really built one other major supercar (and it was technically based on a Lotus, in terms of the vehicles body (btw there’s nothing wrong with that, I’m just pointing it out)). SSC has experience going up against the likes of Ferrari, Porsche, & Bugatti (and doing very well against them), i.e. the Ultimate Aero (which made headlines upon it’s release during the early/mid 2000’s). 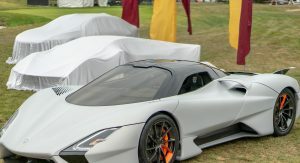 As far as building a 100% from the ground up vehicle, I see the SSC Tuatara (once it breaks those speed records and regains the attention of the world) becoming a halo car for the SSC brand (as they may follow the footsteps of McLaren, releasing some (possibly 1 or 2) “entry level” supercars). I’m beginning to wonder if SSC is nothing more than a pretty little mock up designed to fill in the gaps at prestigious car events, something for the people to look at and take selfies with. Looking at the ticket prices for these events they wouldn’t be worth buying without these one offs in there somewhere. I have talked to them personally and they have informed me that it is a running mock-up. They also informed me to expect greatness of the best quality and execution. You know what I understand your statement now. But I think that there is more to it than just a gap filler. The original 2011 model was meant to be more than what it was (just as this vehicle is more than what it is). 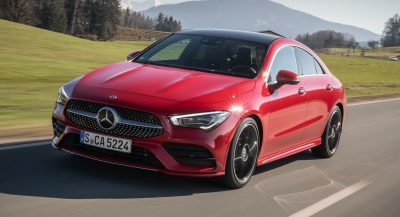 Unfortunately the company saw financial troubles before they could create a 100% running model with the new (and now updated) engine they had built and so far tested for it. …EXCEPT for the rear. wtf is up with that hideus monster. I was wondering the same thing, it looks a little more aggressive than before. I personally like the rear design of the original 2011 (as it looked FAR more elegant). But it may actually (unlike a lot of car companies today making things aggressive for no reason other than to look cool,) be for real aerodynamic (or cooling) purposes. It looks better than the previous rendering, I just wonder about the build quality of it. The build quality on the 2011 version (which they are dubbing as a “concept” now even though it was not a “concept” and rather what the actual production vehicle would be like upon it’s release,) was much better. The Body panel gaps in some areas are quite noticeable, BUT I am sure this is just a prototype and that the final (from the factory floor) version will be much “cleaner”. It’s the interior of the car, that I can’t wait to see. The 2011 is a shell I believe, that’s why the panel gaps can be eliminated easily and yeah can’t wait for the interior. It’s a running mock-up. So the fit and finish isn’t quite there. Really nice design but the build quality looks a bit rough. Notice the huge panel gaps and the leather on the steering wheel in the interior shot. It’s a running mock-up. I have talked with the company. Means notving before it is out on the market. Nice design and astounding performance figures but the build quality is simply disgusting in some places. It’s a running mock-up. I have talked with the company respresentitive. I want to see a true and honest show down. I’m perplexed lately. 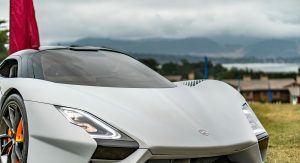 People are getting excited about unobtainium hyper car garbage like this or Divo, but cars that we can actually afford like the new Supra are getting trashed by haters left and right. Wtf is wrong with people?